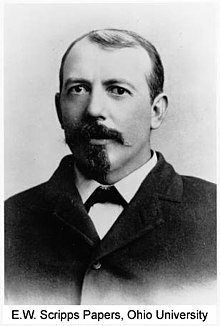 Edward Willis Scripps (June 18, 1854 – March 12, 1926), was an American newspaper publisher and founder of The E. W. Scripps Company, a diversified media conglomerate, and United Press news service. It became United Press International (UPI) when International News Service (INS) merged with United Press in 1958. The E. W. Scripps School of Journalism at Ohio University is named for him. A newspaper cutout of E.W. Scripps, circa 1912. E. W. Scripps was born and raised in Rushville, Illinois, to James Mogg Scripps from London, and Julia Adeline Osborne (third wife) from New York. E. W. was the youngest of five children born to James and Julia. James had seven children from previous marriages. E. W., as with many businessmen of his day, went by his initials rather than writing out his first and middle name. He often signed his middle name as "Wyllis". E. W. was a prolific consumer of whisky and cigars, according to his confidential assistant Gilson Gardner, and was said to drink a gallon (3.79 l) each day while bearing a lit cigar at all waking hours. Both E. W. and his half-sister Ellen worked with his older half-brother, James when he founded The Detroit News in 1873. E. W. started as an office boy at the paper. In 1878, with loans from his half-brothers, E. W. went on to found The Penny Press (later the Cleveland Press) in Cleveland. With financial support from sister Ellen, he went on to begin or acquire some 25 newspapers. This was the beginning of a media empire that is now the E. W. Scripps Company. E. W. would lend money to promising young, local newspaper publishers, and buy the most successful one, having 51% share of the paper. Once bought, he did not "sell out," but held on to the paper. A guiding tenet of E. W. was that local editors know best about running local newspapers. Editors were carefully groomed and given considerable autonomy. Among the innovations E. W. made were distributing newspapers to the suburbs and, with his brother James, of getting the bulk of income from advertisers instead of subscribers. In 1907, Scripps created United Press Associations, later the UPI news service, from smaller regional news services. Scripps later said "I regard my life's greatest service to the people of this country to be the creation of the United Press", to provide competition to the Associated Press. A newspaper fairly and honestly conducted in the interests of the great masses of the public must at all times antagonize the selfish interests of that very class [the advertisers] which furnishes the larger part of a newspaper's income. It must occasionally so antagonize this class as to cause it not only to cease patronage, to a greater or lesser extent, but to make actually offensive warfare against the newspaper. In 1898, he finished building a home in San Diego, where his half-sister lived nearby, thinking that the dry, warm climate would help his allergic rhinitis that he had all his life. He built it as a winter home to escape the cold of West Chester, (Butler County), Ohio but eventually lived there year-round, and conducted his newspaper business from the ranch. His ranch encompassed what is today the community of Scripps Ranch as well as Marine Corps Air Station Miramar. In 1903, he and his half-sister Ellen were the founding donors of the Scripps Institution of Oceanography. Initially Scripps was reluctant to support the venture, thinking scientists could not be businesslike. However, he developed a deep friendship with the scientific director, William Emerson Ritter, and together they began to plan projects for the Institute. As the Institute started to succeed, he became an enthusiastic supporter, and took a great interest in its work. William Randolph Hearst and Scripps were often at loggerheads as to who owned the better newspaper conglomerate. In 1921, Scripps founded Science Service, later renamed Society for Science & the Public, with the goal of keeping the public informed of scientific achievements. The organization continues to run as a non-profit dedicated to the promotion of science. Scripps College is also named in his honor, because a large part of its endowment derives from his newspaper fortune. Scripps died at the age of 71 on March 12, 1926. As requested, his body was buried at sea by being dumped overboard from his yacht. Among his descendants was Samuel H. Scripps (1927 – 2007), grandson, who became a leading philanthropist for theater and dance in America in the late 20th century. ^ "Aide Says Scripps Defied All Maxims". The New York Times. February 18, 1932. Archived from the original on May 2, 2018. Retrieved May 2, 2018. ^ Gardner, Gilson (1932). Lusty Scripps: The Life of E. W. Scripps (1854-1926). New York City. Retrieved May 2, 2018. ^ MacColl, E. Kimbark (1979). The Growth of a City: Power and Politics in Portland, Oregon 1915–1950. Portland, Oregon: The Georgian Press. ISBN 0-9603408-1-5. ^ "A Jew and the California Dream". San Diego Reader. March 29, 2007. Retrieved March 21, 2018. E. W. Scripps and the Business of Newspapers (1999) by Gerald J. Baldasty. ISBN 0-252-06750-9. Molly McClain, "The Scripps Family's San Diego Experiment," The Journal of San Diego History 56, nos. 1–2 (2010). Scripps, E.W. ; McCabe, Charles. Damned Old Crank – A Self Portrait of E. W. Scripps Drawn From His Unpublished Writings (March 15, 2007). Mccabe Press. p. 259. ISBN 1-4067-6151-6. Morris, Joe Alex. Deadline Every Minute: The Story of the United Press (1968 reprint). Praeger (October 31, 1968). p. 356. ISBN 0-8371-0175-1. E. W. Scripps Papers, Mahn Center for Archives & Special Collections, Ohio University Libraries, Athens, Ohio. Manuscript collection, primarily correspondence. Robert E. Burke Collection. 1892–1994. 60.43 cubic feet (68 boxes plus two oversize folders and one oversize vertical file). Contains material collected by Burke on E.W. Scripps from 1910–1994. At the Labor Archives of Washington, University of Washington Libraries Special Collections.